The Marine Corps adopted the motto "Semper Fidelis" in 1883. Prior to that date three mottoes, all traditional rather than official, were used. The first of these, antedating the War of 1812, was "Fortitudine." The Latin phrase for "with courage," it was emblazoned on the brass shako plates worn by Marines during the Federal period. The second motto was "By Sea and by Land," taken from the British Royal Marines "Per Mare, Per Terram." Until 1848, the third motto was "To the shores of Tripoli." Inscribed on the Marine Corps colors, this commemorated Presley O'Bannon's capture of the city of Derne in 1805. In 1848, this was revised to "From the halls of the Montezumas to the shores of Tripoli." "Semper Fidelis" signifies the dedication that individual Marines have to "Corps and country," and to their fellow Marines. It is a way of life. Said one former Marine, "It is not negotiable. It is not relative, but absolute...Marines pride themselves on their mission and steadfast dedication to accomplish it." Marine Corps tradition maintains that the red stripe worn on the trousers of officers and noncommissioned officers, commonly known as the "blood stripe," commemorates those Marines killed storming the castle of Chapultepec in 1847. Although this belief is firmly embedded in the traditions of the Corps, it has no basis in fact. The use of stripes clearly predates the Mexican War. 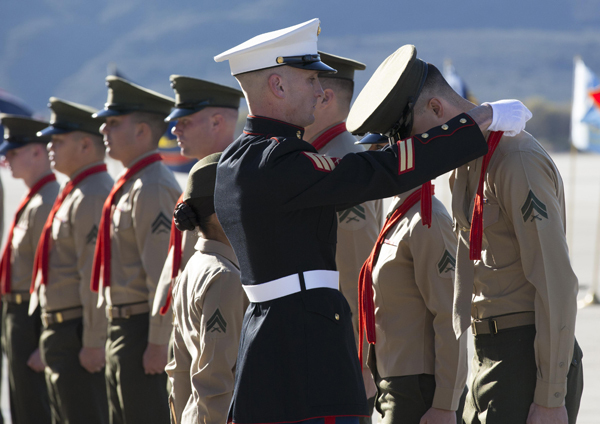 —Corporals with Marine Light Attack Helicopter Training Squadron 303 receive their blood stripes during a Blood Stripe Ceremony aboard Marine Corps Air Station Camp Pendleton. (USMC photo by Lance Cpl. Michael Thorn). In 1834, uniform regulations were changed to comply with President Andrew Jackson's wishes that Marine uniforms return to the green and white worn during the Revolutionary War. The wearing of stripes on the trousers began in 1837, following the Army practice of wearing stripes the same color as uniform jacket facings. Colonel Commandant Archibald Henderson ordered those stripes to be buff white. Two years later, when President Jackson left office, Colonel Henderson returned the uniform to dark blue coats faced red. In keeping with earlier regulations, stripes became dark blue edged in red. In 1849, the stripes were changed to a solid red. Ten years later uniform regulations prescribed a scarlet cord inserted into the outer seams for noncommissioned officers and musicians and a scarlet welt for officers. Finally, in 1904, the simple scarlet stripe seen today was adopted. "The Few. The Proud. The Marines." 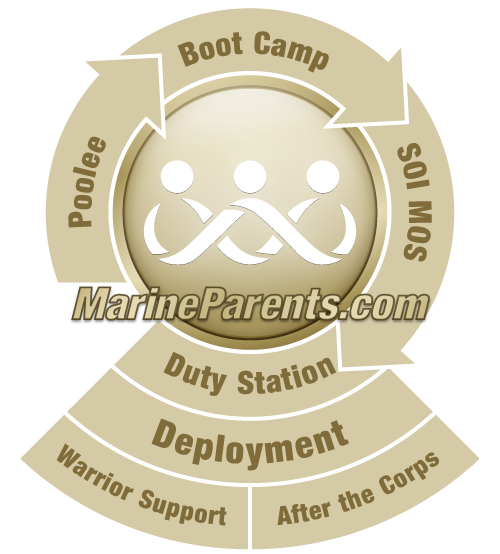 has been used by the Marine Corps since 1977. It won a place on Madison Avenue's Advertising Walk of Fame during Advertising Week 2007. "This slogan reflects the unique character of the Marine Corps and underscores the high caliber of those who join and serve their country as Marines," said Maj. Gen. Richard T. Tryon, commanding general, Marine Corps Recruiting Command. An expression of enthusiasm used by Marines in various situations. Specifics regarding the origin of the spirit cry are sketchy and we're still searching for accurate and reliable information. In 1776, the Naval Committee of the Second Continental Congress prescribed new uniform regulations. Marine uniforms were to consist of green coats with buff white facings, buff breeches and black gaiters. Also mandated was a leather stock to be worn by officers and enlisted men alike. This leather collar served to protect the neck against cutlass slashes and to hold the head erect in proper military bearing. Sailors serving aboard ship with Marines came to call them "leathernecks." Use of the leather stock was retained until after the Civil War when it was replaced by a strip of black glazed leather attached to the inside front of the dress uniform collar. The last vestiges of the leather stock can be seen in today's modern dress uniform, which features a stiff cloth tab behind the front of the collar. The term "leatherneck" transcended the actual use of the leather stock and became a common nickname for United States Marines. 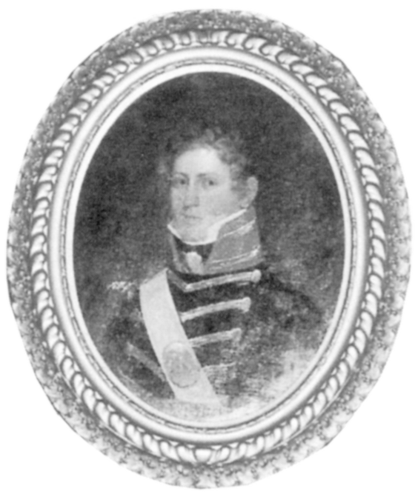 —First Lieutenant Charles Rumsey Broom wears the high "leatherneck" collar in an a portrait circa 1817. (Image released).